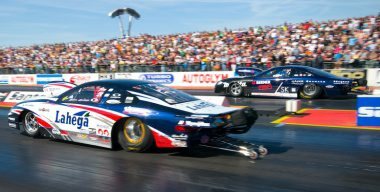 This database contains a collection of European drag racing quarter-mile elapsed times, found in the web publication or submissions by drivers and the organizers. This is not, and will probably never going to be, a complete list but if almost everyone involved provide additional information it probably will. I therefore appeal to all of you, cup- and race organizers, drivers and others who have access to the results list or time sheets from races around Europe, to send them to me for completion of the database. I would also hope that any errors identified are sent for revision. I concentrate, initially, on quarter-mile race results. I use official result lists from competition and license runs. In Sport Compact classes time tickets are accepted. The database contains a collection of results in classes with comparable results, namely the FIA / FIM classes, Comp Eliminator and regional classes as "Top Doorslammer", "Fuel Altered", "Funny Bike" and "Top Gas Bike".